Why not reach for it right now? I believe Team Cupertino will make one of the biggest business pivots of all time within the next 72 days – by year’s end 2017. Or, you can take control over your financial destiny – as the company creates another $1 trillion in wealth. Millions of investors think of Apple Inc. (NasdaqGS: AAPL) as a device company, which is why they fawn over every new iPhone release, hyperventilate when a new MacBook comes out, and go bananas when the next generation iPad launches. In reality, Apple hasn’t been that company for years. Behind closed doors, the company has been driven by the ecosphere since at least 2010, in a shift that’s only just now becoming apparent to the public. Many investors – present company excluded – think they’ve got this covered, but I’m not so sure. If they did, then they wouldn’t be fawning all over the latest iPhone releases, nor would they be hyper-concerned about talk of poor sales and supplier problems, as was the case Thursday when Apple’s shares got pounded. The fact that traders and investors are willing to speculate over such a short-sighted new item tells me that they still don’t see the big picture like we do. It also tells me that they have no idea what the ecosphere actually means for Apple, let alone how valuable the company will become. Trash talking news about this Apple supplier or that one has plagued Apple since the dawn of time. More to the point, it’s kept retail investors out of one of the greatest stocks in the history of financial markets. Again, present company excluded. Apple’s already the single largest wealth creator in the history of the stock market by virtue of the fact that it’s created more than $1 trillion in wealth for savvy investors. Every $10,000 invested when the company IPO-ed is now worth a jaw-dropping $3,183,690 as of last night’s close. That pales in comparison to Apple’s next move. The conventional wisdom is that companies create value by selling products and services the world wants – which is why investors become so hyper-focused on gee-whiz devices. A company’s business strategy is where the real value-add comes in. It’s why Apple is what it is today and why FitBit Inc. (NYSE: FIT) and GoPro Inc. (NasdaqGS: GPRO), for example, struggle to remain relevant in hotly competitive markets that are rapidly leaving both behind. That’s a good part of why I continually reinforce the need to pay attention to CEOs as a part of the investing process, especially if what they’re doing unlocks a new dimension in revenue and profitability. Take PayPal Holdings Inc. (NasdaqGS: PYPL), for example. Co-founders Peter Thiel, Max Levchin, and Ken Howery founded the company as Confinity and originally made security software for handheld devices. Confinity merged with X.com and then made the pivot to online payments when then CEO Elon Musk made the decision to terminate all other Internet banking operations. PayPal joined the Fortune 500 in June 2016 and generates $10.84 billion in annual revenue today. Or Google – now Alphabet Inc. (NasdaqGS: GOOGL). Founders Larry Page and Sergey Brin had no apparent business strategy in the company’s early days when it lurched from idea to the next. Believe it or not, Google sold appliances back then, and even its own search technology to other websites. In 2003, the company made a pivot to AdWords that allowed companies to pay for advertising based on search terms. Google generated more than $20 billion in 2008 and today, as Alphabet, maintains a top line of $90.27 billion. Then, there’s Facebook Inc. (NasdaqGS: FB). It’s hard to imagine today with 1.3 billion daily active users, but Facebook used to be a “secret society” open only to those with .edu addresses from Harvard and a handful of other universities. Then, in 2005, CEO Mark Zuckerberg controversially pivoted to high schoolers and subsequently the following year to anyone over 13 years old. Today the company generates $27.64 billion a year and has created an estimated $805.6 billion in wealth for investors worldwide. My point is that business strategies are not footnotes as most investors think. Rather, they are deliberate, fundamental shifts intended to open up entirely new business models and revenue streams. Which brings me back to Apple. 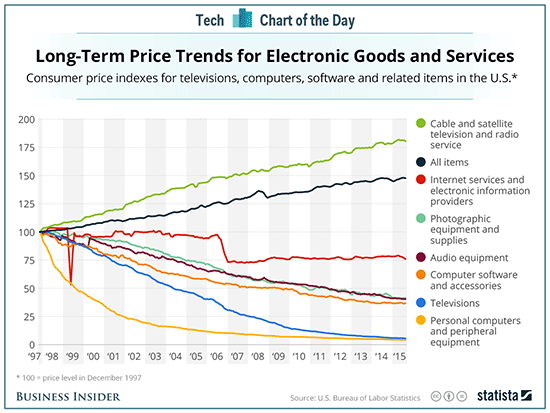 One of the biggest problems Apple has is that it’s got to charge increasingly higher prices for its products in order to maintain its profit margins at a time when hi-tech devices are being commoditized. Eventually, they’re going to run out of customers who can drop $1,000 on a phone or iPad or a fancy watch. The reason why is pretty straightforward – “things” are progressively worth less in today’s world, while infrastructure is worth more. I’ve been quietly researching this for several years now. As part of that, I’ve talked to medical providers, doctors, hospital management, insurance company executives and more. And, I’m more convinced than ever that I am correct. The seemingly disparate data I’m gathering is beginning to connect. What’s more, it’s beginning to trickle into the mainstream media. Here are just a few samples that will help you connect the dots, too. Apple quietly launched HealthKit and ResearchKit in 2015. Both are software platforms intended to provide a framework for researchers and developers to scale medical data collection by tapping into Apple devices around the world. Examples include simple prescription management and reminders, to gathering and remote treatment using data sent directly to medical records. News broke last March that Apple wants to tap into the $3 trillion healthcare information sector by providing special medically compliant iPads, possibly in conjunction with Cisco and IBM who supply health care systems and large hospitals in bulk. News broke in August that Apple and Aetna Inc. (NYSE: AET) have been in secret talks with the goal of providing the Apple Watch to more than 23 million of Aetna’s customers. Not coincidentally, according to CNBC, there were also chief medical information officers from around the country in attendance. Similar invitation-only meetings have reportedly been held in Canada, too. Just this week, news broke that Apple actually tried to acquire the start-up firm Crossover Health, and has since approached One Medical, a primary care group. The common thread here is what Apple needs to make all of these things gain traction – a way to subsidize the technology so that consumers who couldn’t otherwise afford, or who wouldn’t otherwise buy, an Apple product are brought into Apple’s orbit. To me, that’s having one or more Apple devices recognized as medical devices. When this happens, doctors all over the world could prescribe Apple products and insurance companies would pay for ’em. Revenues would skyrocket, profit margins could double, and Apple’s ecosphere is suddenly the center of the proverbial universe. The $195 a share I put up as a target at the beginning of this year may not be high enough. The move to medical devices is the kind of strategic shift that could propel Apple to double that while simultaneously locking out the competition long enough for it to build a monster head start the way it did with the iPhone in 2007 when former Microsoft Corp. (NasdaqGS: MSFT) CEO Steve Ballmer thought it was a joke. I’ll even go so far as to say that Apple’s shift to medical devices may be the single largest corporate reinvention of the last 50 years. And, yes, if you’re doing the math that means my $200 price target just became a $400 price target. Not immediately, of course, but longer term when this idea has matured. Obviously owning Apple is a good idea given where I think the company is headed. We’ve frequently talked about all the ways you can own Apple, so I’m not going to repeat that here. Instead, take a spin through the archives to learn more about how to buy Apple stock on the cheap, Apple options, ETFs, and 26(f) programs. 26(f) programs are a special class of investment – often tax-free – that could enable you to rake in thousands of dollars per month in extra income. My team and I compiled a list of ten that we think have the most potential to boost your income and deliver life-changing returns. One 26(f) program in particular lets you tap into profits from Apple, but also Amazon, Facebook, Alphabet, and more – all in one fell swoop. If you’re an American taxpayer, you’re able to “enroll” in 26(f) programs today. Click here to learn more. But playing Apple isn’t the only way to ride this gravy train when it happens. There’s a bigger play you can make – and it’s still early enough in the game to snag a first-mover advantage. I see even more profit potential ahead for those investors who are savvy enough to play the input companies that’ll be essential to Apple’s move into the medical device sector. Think about companies like McKesson Corp. (NYSE: MCK), which already provides software and connectivity technology to the health industries. Or Viavi Solutions Inc. (NasdaqGS: VIAV) and Lumentum Holdings Inc. (NasdaqGS: LITE), which develop key optical technologies for 3D motion sensing, among other applications. I think Apple will buy a bunch of them at a huge premium as this story unfolds. It’s just a matter of who proves most worthy. It’s a story we’re going to return to several times in the months ahead, especially as the rest of the world begins to figure out what you and I already know to be true. Apple’s move into the medical sector will align the company with four out of the six Unstoppable Trends we follow… and you know what that means when it comes to your money. The healthcare sector is a gold mine of profit potential, and Apple’s pivot is just the tip of the iceberg. Take this tiny $6 million startup, for example. They’ve improved a device that (secured with more than 40 patents) could utterly eliminate disease forever. It’s a massive breakthrough for the medical sector, and one that could mean massive profits for investors who get in on the ground floor. Royalty payments alone could add billions of dollars to this company’s bottom line, and the resulting products could be worth billions more. They’re expected to make a huge announcement in early November – one that could turn the entire industry on its head. That means you’ve still got time to make your move (but not much). Find out how to claim your piece of the action by clicking here. While Apple is a great company, the prediction at the top of this story has not come to pass. I will continue to be long Aapl, hoping that they do in fact shoot into the stratosphere.